It won’t be long until it is Halloween again, and plenty of people are already considering how they will dress up their dog. Besides Halloween, there are lots of other occasions where dog costumes may be relevant, even if it is just a normal day. After all, what is cuter than a small sausage dog in a hot dog customer, with some ketchup or mustard on their back, in a plain or sesame seeds bun? This costume is one of the most popular ones around, but there are many others as well. Consider, for instance, the Star Wars saga. Star Wars is something that has gripped the world for many decades now. Nothing is impossible in those movies, so why not find out whether your dog has “the force”? Dogs are part of our family, and they are allowed to have fun just as much as we do. Hence, whether you’re trick or treating or you’re just out for a laugh, the following Star Wars costumes may be perfect for you. There are lots of costumes available on the market for dogs of any size. It is very important that you choose one that properly fits your dog. Measure your animal’s neck circumference, the broadest part of their back, and the length between the base of their tail and that of their neck, and compare this to the sizes listed on the costume. Don’t be tempted to just pick an S size because you have a small dog, you really have to pick the right size so that they are comfortable in their costume. This is a particularly popular costume, albeit mainly for small dogs. The dog is wrapped in a costume with two buns, one on either side of the animal. You can choose seeded or plain buns, and they can even be embroidered to make it look like ketchup or mustard. Usually, these costumes stay in place through Velcro, so they are super-comfortable. If you are on the lookout specifically for a Halloween costume for your pet, then a pumpkin really is the way forward. This is a great costume for larger dogs, in which they are wrapped in a big pillow that looks like a pumpkin. Do make sure you add a little green stem hat to really complete the look. It’s up to you whether you choose a plain pumpkin, or a Jack O’ Lantern design. The “adorable, you will be” dog. 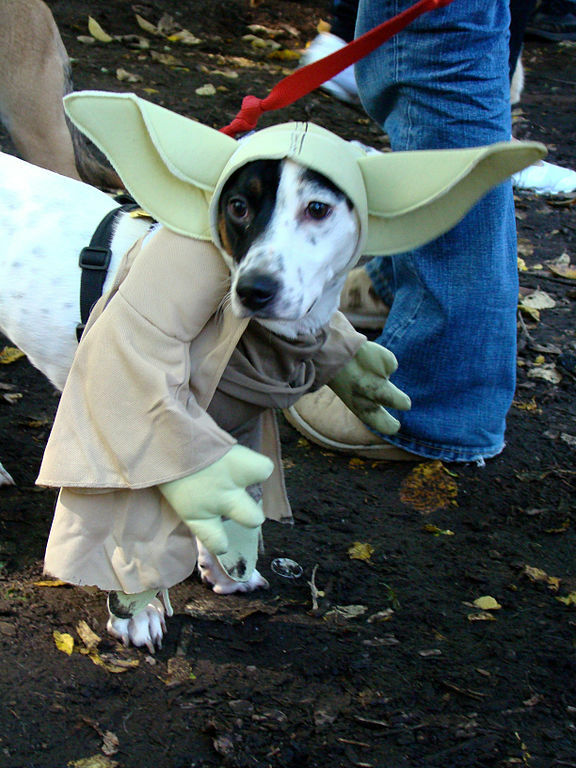 This is a great Star Wars-inspired costume whereby your dog is made to look like the great Yoda. A good model will come with a big eared, green headpiece and a type of jumpsuit that will make it look like your dog is ready to take on a philosophical debate. Why not turn your dog into the greatest of all Jedi Masters, particularly if you are a Star Wars fan yourself?